The candy-colored collection is available to purchase exclusively at Target. For those struggling with the winter blues, we’ve got the most stylish solution to brighten your day (and your living rooms). Blogger, author, and now designer Joy Cho —you know her as the creative mind behind popular blog Oh Joy!— just released her first upholstered furniture collection. The 19-piece collection is a vibrantly-colorful dream, featuring every piece of furniture you need to revamp your living space. Fans of Oh Joy! will recognize the blogger’s signature bold-patterned and bright-colored aesthetic reflected in each item of the line. From a printed daybed to a multipurpose storage bench, the whimsical motif is present throughout the collection. Cho designed the collection in collaboration with Chicago furniture company Cloth & Company. This statement furniture line is the brand’s first-ever influencer collaboration. “I’m thrilled to partner with Cloth & Co for our first furniture collection. The marriage of our bold, colorful and whimsical prints with the incredible quality and style of Cloth & Co’s furniture is what designer’s dreams are made of! For the living room, bedroom, or playroom, there are pieces to add a touch of whimsy and joy to any space in your home,” says Cho. “Cloth & Company’s technology and digital printing capabilities give us the freedom to produce endless collections. We have the ability to collaborate with artists and influencers both in and out of the home furnishing space without any inventory or risk. 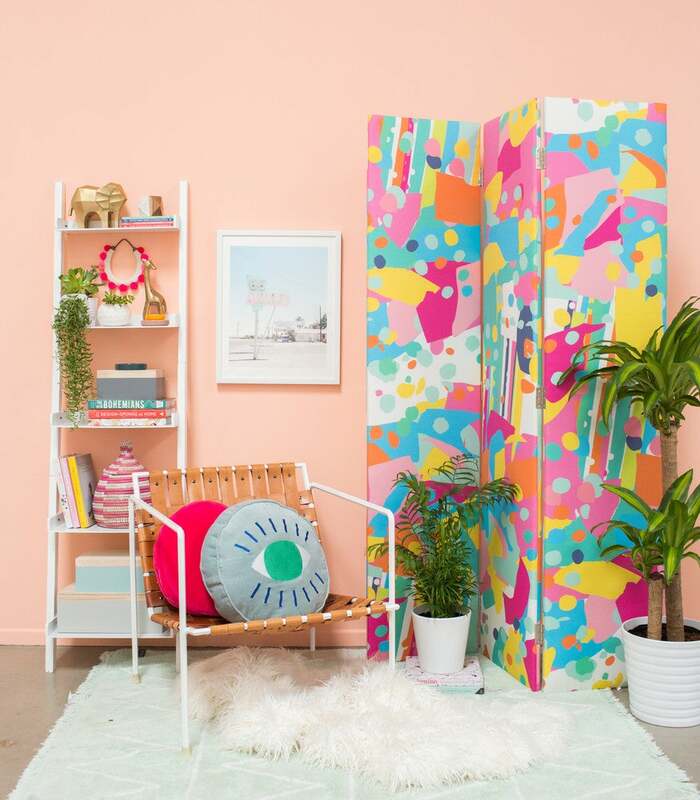 We love the bold prints of Oh Joy!’s brand and are thrilled that she will be our first partner,” adds Cloth & Company co-founder Christiane Lemieux. The collection is available now at Target, with prices starting at $300.